Defense lawyer Jaime Aleman holds up evidence as he makes a point to the jury during closing arguments in the capital murder trial of Eloy Alcala in the 275th state District Court at the Hidalgo County Courthouse on Thursday, Oct. 18, 2018, in Edinburg. 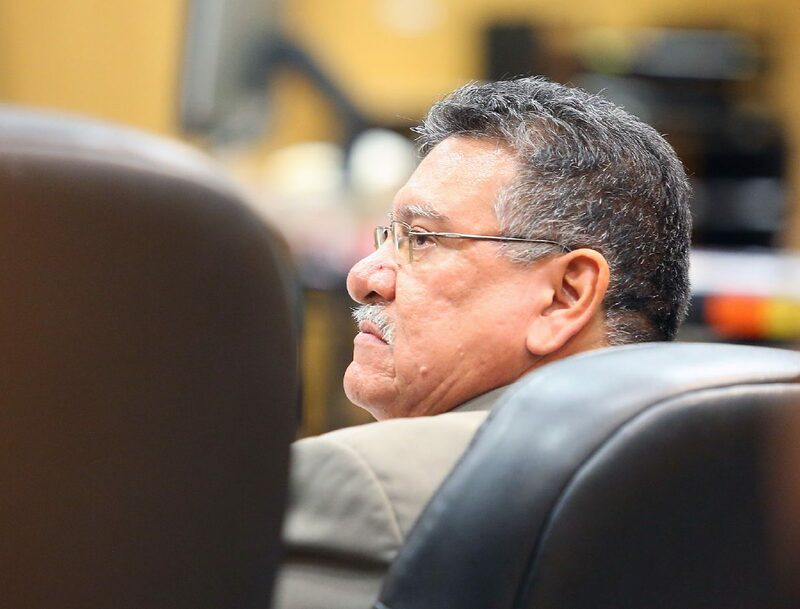 EDINBURG — After four weeks of testimony, jurors began deliberating Thursday in the Eloy Heraclio Alcala capital murder case, after the prosecution and defense had their final chance to present their version of the case. Visiting state District Judge Romeo Flores sent jurors home Thursday after an hour of deliberation, and will return to the courtroom at 8:30 a.m. Friday. Alcala, 51, declined to testify Thursday and has maintained his innocence in the deaths of David Garcia, 21, and Victor De La Cruz, 35, who were shot at close range in the early morning hours of Oct. 8, 2010, at the intersection of Sabino Avenue and Santa Monica Street in Pharr. Alcala is one of two defendants in the case, his son, Eloy Jiovanni Perez Alcala, having been convicted in a 2011 trial. Alcala Sr. was convicted as well in 2012, a few months after his son was sentenced to life in prison, but won a new trial on appeal in 2014. With no eye witnesses to the shooting and no murder weapon discovered, Assistant District Attorney Monica Baron Auger, the lead prosecutor in the case, urged jurors to analyze the circumstantial evidence. Auger and her co-counsel, Assistant District Attorney Carisa Rivera Casarez, argued throughout the trial that the father and son shot Garcia after he and Jiovanni got into a physical altercation hours before. Afterward, the Alcalas arrived at Garcia’s house around 1 a.m., only to find him not there, according to testimony from Garcia’s mother and sister. De La Cruz, Garcia’s cousin, was “unfortunately in the wrong place at the wrong time,” Auger added, noting that he was shot in the back as he tried to run away. She highlighted for jurors the fact that a pink receipt matching those discovered in the elder Alcala’s truck — which fit the description of the suspect vehicle neighbors gave to police — was found next to a casing at the scene of the shooting. Garcia’s blood was found on the sole of Jiovanni’s shoe and De La Cruz’s blood on his jeans, and both Alcalas had gunshot residue on their clothing and on the father’s hand. “This is not a theory, this is not something that I am trying to make fit. 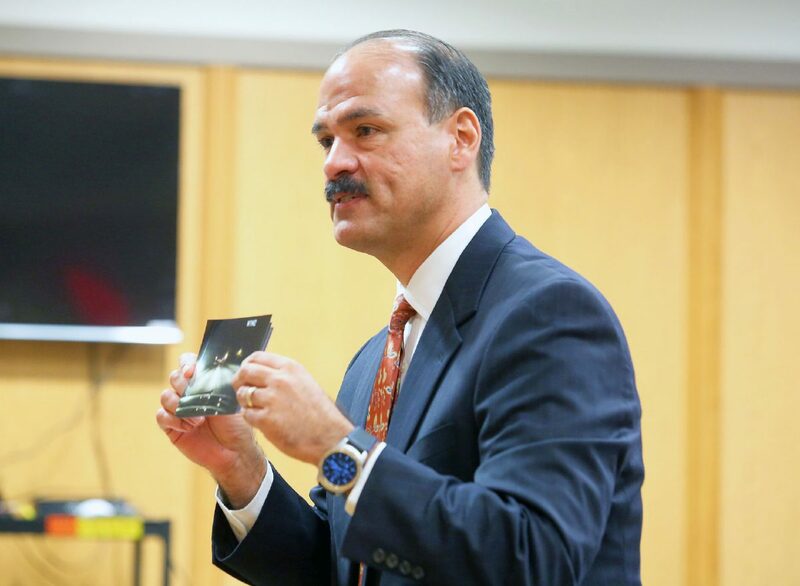 These are facts; this is evidence,” Auger said, a response to the defense’s critique throughout the trial that the Pharr Police Department recovered and selected evidence for forensic analysis that fit a narrow theory. In his closing argument, Alcala’s lead attorney Jaime Alemán argued that the state’s case against his client has always been about a theory. His stance during trial has been that the true killer, or killers got away due to a lack of investigation by police. “The problem with the theory is that it only wants you to look at what fits in that story and it wants you to disregard anything that does not fit …” he said, pointing to discrepancies between police officers’ reports and statements made eight years later on the stand, and asking why certain pieces of evidence were never analyzed, such as blood found in Jiovanni’s car in which his altercation with Garcia allegedly took place. Alemán also highlighted how testimony given by the victims’ family members differed from their initial statements to police, and questioned why the prosecution decided not to bring the neighbors who called 9-1-1 reporting the shooting as witnesses, arguing it was because their version of events don’t fit the theory of the case. While many police officers were brought before the jury, not all were called, such as the main investigator tasked with overseeing the search of the Alcala residence. “When you think about this night, honestly, do you really have a clear idea what happened, what was going on? Do you really have a timeline in your mind?” Alemán asked the jury. “It’s not your job to solve the case … as jurors it’s your job to hold (the prosecutors) to their responsibility, hold them to their burden, hold them to their proof, and unless you’re convinced … (the law) says you must find the defendant not guilty,” he said. If convicted of Garcia and De la Cruz’s murders, Alcala will be sentenced to life in prison without the possibility of parole.